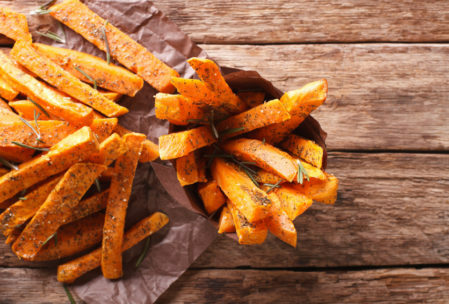 Sweet potato fries are tricky to get crispy, but if you coat them with the right ingredients and be patient, you will have stellar french fries to munch on. The perfect side to most anything! Cut the potatoes into 1/4″ thin strips. Mix all other ingredients together in a large bowl and toss with the potatoes until they are evenly coated. Transfer the potatoes to a large baking sheet covered with parchment paper. Spread the potatoes in a single layer. Try not to overcrowd or have multiple layers of fries, you want them to be roasted, not steamed. Place in the oven and cook for 25-30 minutes, turning the fries once or twice during that time to cook evenly. May take more or less time, depending on the size and thickness you cut the fries. While fries are cooking, mix together ketchup and curry to make your dipper. Remove once the edges slightly begin to brown and fries begin to crisp. Sprinkle course salt on top when they are hot out of the oven.